This last weekend in August, I had the pleasure of sharing at Adventist Fellowship in Tulsa, Oklahoma. The title of my weekend was You, God and Jesus. By the request of the pastoral staff, I began Friday night with the story dabout my dad that you can find in the first chapter of the book Finding the Father. The purpose was to consider our internal ways of thinking, that we all possess, about a Divine Being. When we think of God, what comes to mind? We talked about how each of these pictures is unique because each one of us is unique. And God is big enough to encompass all of these ideas. Yet within each of our pictures of God, we find a mixed bag. Some ways of viewing a Diving Being compel us toward the creation of a safer and more compassionate world for all. But other ways in which we view a Divine Being are very harmful. They cause us to create spaces that are very unsafe for those who are not like ourselves and in which fear replaces compassion. It is these harmful ways of picturing a Divine Being that the Jesus story challenges most fundamentally. The next morning, we continued to look at what the Jesus story tells us about human suffering. For those who embrace the idea of a compassionate deity, the problem of explaining why humans suffer gratuitously and needlessly provides, in my opinion, the greatest philosophical challenge. What I also find odd is that although the Jesus story prevents us from resolving this challenge in harmful ways, the Jesus story doesn’t really explain it either. In other words, we can see in the Jesus story what the wrong answers to why humans suffer are, but the story seems to be more concerned with teaching us the way to end human suffering rather than satisfying our curiosities by simply explaining it. Think of it this way: We understand why suffering exists. Now we can all go home with all our questions answered. But that doesn’t put food on the tables of those who are actually going hungry tonight. The Jesus story does not waste time debating philosophical “whys.” That is a very Hellenistic way of approaching the reality of suffering. What the Jesus story give us is the “hows” of what to actually do about it all. The gospel of Jesus is first and foremost a gospel of liberation, announcing the good news of freedom from all things that prevent us from being fully human. In the next presentation, I offered three reasons that the Jesus story is still relevant in our contemporary culture. The first is Jesus’ teachings on the liberation of those that who oppressed by and subordinated to others. The second is Jesus’ passion for the oppressed and marginalized who were in need of liberation. And the third is the most compelling reason for me: Jesus’ courage. 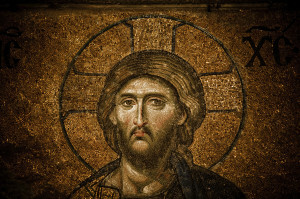 Jesus knew where his teachings would lead, he knew what his passion for the excluded would cost him, and even though he knew he would be exterminated by the status quo, his passion for those who were hurting gave him the courage to teach his gospel anyway. We finished this presentation with the good news of Jesus’ resurrection and what the resurrection event means to all who are subordinated or oppressed today. We closed the weekend with Jesus’ new world that he modeled for us in the shape of a shared table. We looked at the passages that indicate how the shared table must be non-kyriarchical, it must be non-exclusive, and it must be non-homogenous. We looked not only at where Jesus taught these descriptors but also at why they are so necessary if we are going to follow Jesus into a safer and more compassionate world for everyone. We are all children of the same Divine parents, and we must learn how to sit around the same family table once again. We ended the weekend with a question and response session. Overall this session was positive. There were three individuals who repeatedly wanted to debate my public defense of including those of the LGBTQ community even though at no time had I brought this up in my presentations. At the end, a gentleman who I had never met and who was visiting approached me and thanked me. He expressed how much had genuinely enjoyed the entire weekend until this last part. Then he confided in me his own orientation. “I’m gay,” he said. “The hatred in this room right now is palpable.” I apologized. I assured him that the voices he heard were only those of a very afraid few. But we all know how effective a vocal minority can be at making those who are different from them feel unsafe. Needless to say, I walked away with a heavy heart. It was bittersweet, a mixture of emotions. To all who made this weekend special, I thank you from the bottom of my heart. Thank you for YOUR effort to provide a welcoming place in which others can encounter Jesus. We all have a long way to go still. I pray we continue on the journey. The gospel of Jesus is a gospel of liberation from all things that prevent us from being fully human. He’s still out there recruiting. For all of you who are supporting RHM in the work that we do, I want to thank you as well. Together we are making a difference. We are making an impact. The mustard seed is growing, one human heart at a time. We could not do what we do without your support.